Other than the crazy icicles that have covered our trees today (pictured above), I'm loving the entrance into spring. It seems that Oklahoma's spring introduction goes something like this: really warm day, really cold day, tornado, perfect spring day, winter weather advisory, smoldering heat. Then we even out a bit for just a smidgeon of spring before summer sweeps in and takes us by surprise. The seasons always make the switch just in time though. I spend the end of one season looking forward to the beginning of the next one. And when it first changes, I love it. Right now, when I think about getting into a hot car on a summer's day wearing shorts and a tank, sporting a sweaty hairline, and feeling the air conditioner blast in my face, I get excited. But I know that by the end of summer, I will be yelling at summer to leave me alone. I don't ever hear anyone complaining that they wish the summer heat would stay around a bit longer or that the bite of the cold Oklahoma winter wind would keep a-coming. Yesterday I was folding laundry and needed help passing the time, so I decided to listen to some old school Nichole Norman. "This Mystery," in particular. "Every Season" is one of the many big hits on this album from 2000. I guarantee it was (is) performed in churches everywhere as "special music" and was (is) used as the background song for countless videos. It's just one of those songs. And it's really good. As this song came up on my iTunes the other day, I was struck by the order of these seasons and their descriptions. They fit my last year perfectly. The seasons lined up exactly with the actual spiritual season I was experiencing. Summer - This was an exciting time for me. Goals were getting accomplished and things were good. But out of nowhere, this carefree summer turned into a really scary time. Autumn - I had to come to terms with my anxiety and actually get help, realizing this was more than just a one time deal. This was a battle and it was going to be hard. Winter - I was tired and exhausted, wanting to be done with all of it. I wanted it to be easier. Spring - Like a breath of fresh air, I'm gradually connecting pieces of my story that I'd never connected before. I'm starting to see glimpses of a bigger picture and feeling so much purpose in my life. I am living in spring right now, both physically and spiritually. No, it's not easy or pain-free, but there's a hope about it that I've never experienced before. And I know it's not a fair-weather hope. It's here to stay. It's been given to me and it's my foundation and it's how I operate now. It's the new me. I think God gave us a tangible, repeating pattern of seasons so that we could see it with our own two eyes over and over and over. (He knows how easily we forget things.) We know that just when we're ready for a new one, it's waiting for us. We don't cross our fingers for cold weather in December. We know it'll be cold. And we know that relief of fresh, breezy, warmer air will make its appearance sometime at the end of March. We expect these things. We go through different seasons in our lives. Some seasons last for a few months while some last for years. But you know what I've learned? The season really does change. It's not going to be winter forever. It just can't be. It's not possible. That's not how it works. 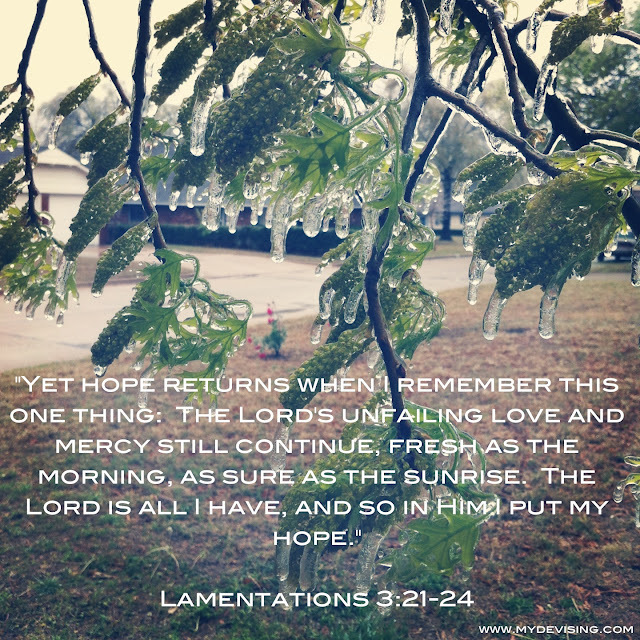 God not only told us of these seasons of life (Ecclesiastes 3), but he decided to show us. We see it in the trees and in our flowers blooming and in the rotating of our wardrobes. We see the seasons change. In Christ, we have this hope - the hope that even when the season seems unbearable and unending, it will change and it is happening for our good. The hope of spring is just around the corner.